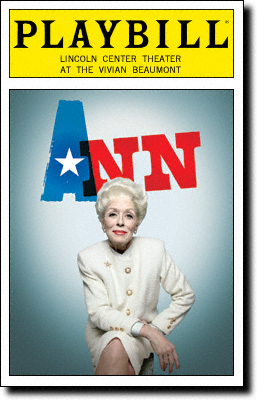 …that if you’re in New York, go see Ann before it falls off the fiscal cliff! (That’s of course just theater lingo for “closes today!”) Ann is a biographical, one-woman show about the late Texas governor Ann Richards, written and performed by Holland Taylor of Two and A Half Men fame (although the question proliferating throughout the audience was, “She was in Romancing the Stone?” Playbill does not lie, so yes). One would assume, as surely the producers did, that this week’s events in the Texas Senate as well as the onslaught of Supreme Court rulings would drive the politically minded to boost ticket sales; unfortunately empty seats were at a surplus. But the show is insightful and relevant nonetheless in the face of today’s political quagmires. The plaintiffs and filibusterers in this week’s news certainly gave politics faces (because “debt ceiling” can be kind of abstract), but this show gives politics a personality and a heart. Starting with a fictitious college commencement address and amphorously navigating to an afternoon in Office and then a dreamlike call to action, Taylor offers through Richards a no-nonsense, witty, and ultimately compassionate glimpse into the mind of one of the “them” that works our government and shapes our nation, free from the verbal clichés we’ve heard all week. It is truly a hidden gem, housed up at Lincoln Center’s Vivian Beaumont Theater rather than something more Times-Square adjacent. It also produces more genuine laughs than supposed “master of comedy” Christopher Durang’s Chekhovian mosh pit.